Triple H and Stephanie McMahon are in the ring to start the show. McMahon welcomes us to the show and talks about the Elimination Chamber Tag Team match to determine the Women’s Tag Team Champions. Triple H states that Daniel Bryan will also have to put on a tremendous performance to survive Jeff Hardy, Mustafa Ali, Samoa Joe, Randy Orton, and AJ Styles inside Elimination Chamber. McMahon mentions “Rowdy” Ronda Rousey has to defend her RAW Women’s Championship against Ruby Riott. Triple H says if Rousey is successful in that defense, she’ll go on to WrestleMania to defend that championship against “The Man” Becky Lynch. The crowd cheers that. Triple H then says that was the plan until this happened. Video Package: Becky Lynch attacks Stephanie McMahon on RAW after being medically suspended; Lynch slaps Triple H on Smackdown on Tuesday. A loud “Becky” chant fires up. McMahon says in spite of everything that happened last week, they’ll still do what’s best for business and give the crowd what they want. Lynch did see her doctors last weekend, so let’s hear what they have to say. Becky Lynch’s music hits to cut McMahon off. Lynch makes her entrance to a great reception while wearing a big knee brace. Another “Becky” chant picks up. Lynch says it’s nice to be here. Triple H and Stephanie look good. The swelling on their faces went down, so she’ll hit them harder next time. Triple H says this all escalated quickly, so they want to put it behind them. Triple H says he crossed the line accusing her of manufacturing an injury, so he apologizes. Lynch saw her doctors. They consulted with WWE doctors, and they believe that there is no tear. After a few weeks, Lynch will be medically cleared. As of this moment the suspension is lifted. The match at WrestleMania is on. Lynch is really pleased and shakes hands with Triple H.
McMahon gets in Lynch’s face, and they argue. Triple H breaks it up. Triple H tells everyone to calm down. Triple H says this is not the hill Lynch wants to die on. Lynch needs to think clearly and put her stubbornness behind her. Does she want to fight here or fight at WrestleMania? Will she throw it all away? Triple H says he’s giving her a choice, but by the end of the night he needs her to come out and tell them her choice. 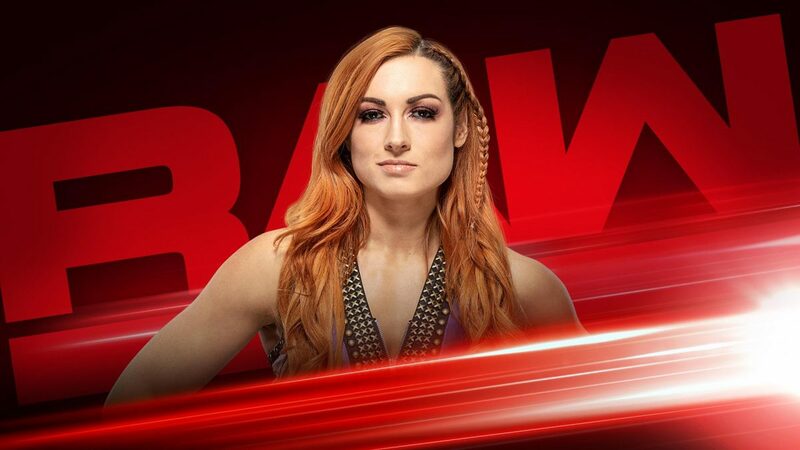 Will she go to WrestleMania, fight for her dream, and fight Ronda Rousey to show the world that she’s The Man or will she choose to throw it all away? Triple H says, “The choice is yours.” Triple H and McMahon leave the ring. Another loud “Becky” chant picks up. Lynch glares at Triple H and Stephanie. Sasha Banks starts against Nia Jax. Banks slaps Jax in the face and forcibly tags in Liv Morgan. Morgan looks stunned. Jax avalanches her. Morgan goes for a tag to Banks and Bayley, but they get off the apron. The losing team is first in the Elimination Chamber. Sarah Logan tags in, but Jax soon picks her up. Logan slides off, but Jax head-butts her. Tamina tags in, and she stomps Logan. Tamina clubs her on the back, and they whiff on something. Morgan tags in and covers Tamina for a two count. Tamina quickly takes Morgan down before giving her a scoop slam for a two count. Tamina applies a chin lock, but she soon lets go and tags in Jax. Jax womanhandles Morgan before staring at Logan. Morgan punches away at Jax and dropkicks her twice. Jax is down on her knees. Bayley blind tags in and goes to attack Morgan, but she shoves her into a Jax avalanche. Ruby Riott knocks Banks into the barricade. Logan follows up with a knee to the face. We come back from the break to see Morgan applying a chin lock to Bayley. Ringside doctors are checking on Banks down at ringside. Morgan tags Tamina in, and Tamina head-butts Bayley down. Officials are helping Banks to the back. Tamina head-butts Bayley down again. Bayley sidesteps a superkick and rolls her up for a two count. Bayley catches her with a jackknife cover for another two count. Bayley drops Tamina on the ropes and tags in Morgan. Morgan tags in Logan, and they hit Tamina with a double dropkick. Logan hits a running knee on Tamina before tagging Morgan back in. They hit a wheelbarrow splash on Tamina for a two count. Logan tags in, and she steps on Tamina’s ankle. Tamina elbows Logan down and clubs away at her. Jax tags in and throws Logan before avalanching her in the corner. Jax drops an elbow on Logan before applying a cobra clutch. Logan gets out and sidesteps Jax to send her shoulder-first into the ring post. Tamina blind tags in and knocks Morgan off the apron. Tamina hits a Samoan Drop and goes for a Superfly Splash, but Logan gets her knees up. Morgan and Bayley tag in. Bayley shoulders away at Morgan before kneeing her. Bayley snaps Morgan and Tamina off the middle ropes. Bayley slides through the corner turnbuckle to dropkick Morgan and then Jax. Bayley clotheslines Riott down at ringside. In the ring, Bayley knees Morgan in the face before going to the top rope. Bayley hits a diving elbow drop, but Logan breaks up the pin. Bayley hits a snap back suplex on Logan. Morgan then catches Bayley with an inside cradle for a near fall. Bayley hits Bayley-To-Belly on Morgan. Tamina then comes out of nowhere and superkicks Bayley. Tamina drags Morgan over to the corner and has her tag in Jax. Jax comes in and hits Bayley with a Samoan Drop for the win. Bayley and Sasha Banks will be the first ones in the Elimination Chamber match for the WWE Women’s Tag Team Championships. They introduce Elias in the ring, then we immediately go backstage to see Finn Balor tell Becky Lynch to wait and bide her time. That’s what he’s doing. Soon, he’ll take Bobby Lashley’s Intercontinental Championship. Balor suggests she not let pride get the better of her and apologize. “Ladies and gentlemen… Elias.” Elias strums a chord, but he’s immediately interrupted by the Lucha House Party. Elias groans in fury. They dance around Elias in the ring. After listening to the Lucha House Party’s music and have them dance around him the entire commercial break, Elias explodes as soon as we come back from the break. Elias is furious that his album wasn’t nominated at the Grammys. Kalisto says they love entertaining the WWE Universe, but tonight they want to Walk With Elias. Elias sits down and tells everyone to shut their mouths. Elias sings about how he used to sing songs for them, but now he has nothing left to give. When he comes to Grand Rapids, he loses his will to live. The city is filled with losers and the people are all the same. Kids, it’s not your fault; it’s your stupid parents to blame for living in Grand Rapids. The crowd boos him. Elias asks the Lucha House Party what they think. They confer and put their thumbs down. Elias says there is no one like them. Elias asks if they think they can do better than him. Kalisto thinks he can. Elias has him sit on his stool and gives him his guitar. Kalisto plays a chord and Lucha House Party celebrates. They’re the only ones celebrating. Elias says he’ll do a duet with Kalisto. He just has to get his other guitar. Elias then smashes the guitar off his back and runs away. Bobby Lashley is at ringside. He’ll defend his Intercontinental Championship against Finn Balor this Sunday at Elimination Chamber. 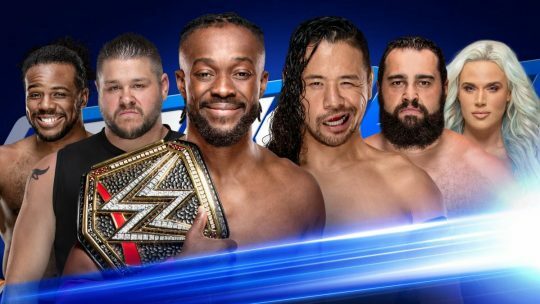 Lashley will team with Lio Rush to make this a handicap match. Lashley distracts Balor, and McIntyre immediately capitalizes. McIntyre whips him hard into the corner, and Balor collapses in pain. McIntyre punches away at him and talks a little trash. McIntyre viciously chops him down and applies an arm bar. Balor fights up, but McIntyre knees him. Balor comes back with a dropkick and puts him on the apron. McIntyre pulls him to the apron and charges, but Balor jumps over him. McIntyre hits the ring post shoulder first. Balor sets up for a plancha, but Lashely and Rush pull the feet. Balor dropkicks them. Balor hits McIntyre with a Sling Blade before dropkicking him into the corner. Balor goes to the top rope, but Lashley knocks him off. The referee calls for the bell. Lashley and McIntyre double-team Balor. Kurt Angle’s music hits, and the WWE Hall of Famer runs down. Angle punches McIntyre before getting in the ring and hitting Lashley with a German Suplex. McIntyre gets in the ring and meets the same fate. Rush tries to kick Angle, but Angle applies the Angle Lock. Baron Corbin then attacks Angle from behind to loud boos. Braun Strowman’s music hits, and he comes down to help. Strowman punches away at McIntyre before throwing Lashley down. Strowman looks at Corbin and gets on the apron. Strowman head-butts Corbin. Strowman goes for a Powerslam, but McIntyre pulls Corbin off. Strowman stands tall with Angle and Balor. We join the match in progress. Strowman takes McIntyre down before tagging in Angle. Angle attacks McIntyre before tagging in Balor. McIntyre quickly knees Balor and tags Corbin in. They stomp Balor down before Lashley tags in. Lashley punches away at Balor before tagging in McIntyre. Balor soon DDTs McIntyre down. Angle tags in and hits McIntyre with a trio of German Suplexes. McIntyre gets away, but Angle hits him with a missile dropkick. Angle connects with an Angle Slam, but Corbin breaks it up. Lashley runs in and hits a reverse STO on Angle. McIntyre covers for a near fall. Corbin tags in and elbows away at Angle before applying a chin lock. Angle fights up, so Lashley tags in. Lashley takes him down and applies a chin lock. Angle fights up and boots him down. McIntyre quickly tags in and stomps Angle’s face. That looks like it connected in a big way with Angle’s nose. McIntyre then throws him out of the ring. We come back from the break to see McIntyre trash talking Angle. Angle slaps him. Balor and Corbin are tagged in. Balor comes in blazing and takes Corbin down. Balor slingshots over him, and Corbin boots him. Balor connects with a step-up enzuigiri. Balor goes for a Sling Blade, but Corbin counters into a chokeslam backbreaker. Corbin punches away at Balor and tags Lashley in. Lashley tags in, and he attacks the ribs. Lashley goes for a powerbomb, but Balor gets out, rolls through, and dropkicks him in the face. Corbin runs in and punches Angle. McIntyre pulls Strowman off the apron, but he’s swatted away. Strowman grabs Corbin, but McIntyre wipes him out with a Claymore Kick. In the ring, Balor sidesteps Lashley before hitting Corbin and McIntyre with a summersault senton. Balor kicks Lashley down and goes to the top rope. Balor punches Lio Rush off the apron and goes back to the top. Lashley crotches him up there and hits a sloppy over-the-shoulder slam for the win. Balor gets his foot on the bottom rope before the three count, but the referee doesn’t see it. Lashley pulls the foot off the ropes for good measure. Referee Chad Patton runs down to explain to John Cone what he did wrong. Cone then tells the ring announcer that they’re restarting the match. Corbin, Lashley, and McIntyre are not happy. During the commercial, Strowman got booted into the crowd. Balor fights up from a chin lock applied by Corbin. Balor fights up, but Corbin tries for an out and in clothesline. Balor counters into a slam. Lashley tags in and works over the injured ribs of Balor. Balor soon takes him down and double stomps him. Balor hits him with an enzuigiri and crawls to his corner, but no one is there. Strowman then emerges from the crowd and comes over the barricade. Strowman tags in to a big reception. Strowman shoulder blocks Lashley down before knocking McIntyre off the apron. Strowman clubs Lashley down before giving Corbin and McIntyre the same treatment. Strowman signals and goes outside to hit all three men with running shoulder blocks. Lio Rush gets one as well. The crowd is into Strowman tonight. Strowman puts him in the ring and gets on the apron. Corbin grabs the feet, so Angle gives him a German Suplex on the floor. McIntyre runs in, but Strowman clotheslines him out of the ring. Strowman counters a Lashley spear into a Running Powerslam. Strowman tags Balor in, and he hits Lashley with the Coup de Grace for the win. We see a video of Kevin Owens at a bowling alley. Owens says he’s trying to spend as much time as he can with his family. It’s painful to watch RAW and Smackdown. Owens doesn’t know where he’ll return to, but he knows when he’ll be back. Owens will be back in a month. Owens then gets up and throws a gutterball. We go backstage to see Becky Lynch. Charly Caruso asks what she’ll tell her fans that are denied the opportunity to see her face Ronda Rousey at WrestleMania if she doesn’t apologize. Lynch says it’s none of her damn business. We see a video honoring the March on Washington in 1963 and the “I Have a Dream” speech. They lock up, and Cross pushes her off before signaling that she is indeed crazy. Cross rolls her up for a two count. Cross applies a side headlock, but Riott gets out and forearms her. Riott hits the ropes, but Cross takes her down with a standing cross-body block for a one count. Riott pushes her away, and Cross jumps on her back. Riott slams her into the corner before pulling her head-first into the turnbuckle. Cross punches Riott back, but Riott soon takes her down for a near fall. Riott whips her to the corner, but she runs into an elbow. Cross has a whip reversed, and Riott avoids a cross-body. Riott kicks her in the ribs, and Cross rolls to the apron. Riott yells that she’s the next champion. Cross elbows away at her and hits a reverse DDT on the apron. Cross hits a cross-body block off the apron and gets her in the ring. Riott soon takes her down and hits the Riott Kick for the win. 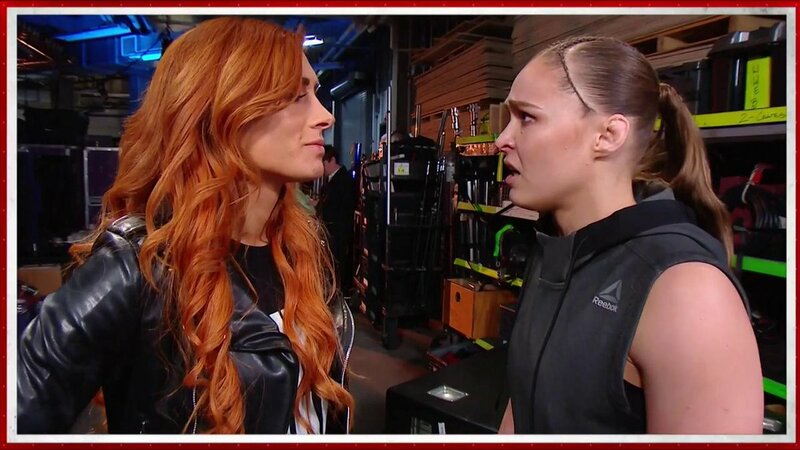 During the above match, we cut to the locker room to see Ronda Rousey confront Becky Lynch. Rousey asks what is more important: being prideful or making history. 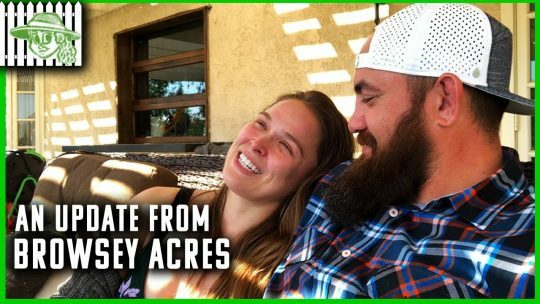 Rousey says it’s time for The Man to man-up. If she says anything other than “I’m sorry” she’ll be admitting to the world she’s too much of a coward to face her at WrestleMania. Seth Rollins makes his entrance to a great reception. A “Burn it down” chant picks up. Rollins smiles. Rollins says he was going to come out here and talk about Brock Lesnar and WrestleMania, but he got a chance to watch that highlight reel from the past year. How about that ride? From running the gauntlet last year and lasting 65 minutes to winning the Intercontinental Championship and defending it on six continents… he was glad to share it with everyone. This was the year he finally felt like Seth Freakin’ Rollins. Rollins rode that wave of momentum all the way to the Royal Rumble and punched his ticket to WrestleMania. Rollins was on top of the world until the bottom dropped out the next night in the form of Brock Lesnar and six F-5s. “Ladies and gentlemen…” Paul Heyman comes out to the stage and introduces himself. Heyman has a WrestleMania-level surprise for them. Heyman introduces Brock Lesnar… but he is not here. The crowd boos. Rollins says that’s no surprise. Heyman says ignorance is indeed bliss. Heyman is here to educate the crowd and Rollins. Rollins is operating under the misguided notion that all men are created equal. They’re not. Does Rollins really believe in his heart that his DNA matches Brock Lesnar’s DNA? Rollins is a top tier athlete and one of the best he’s ever seen… but Brock Lesnar is a Beast. Brock Lesnar is a predator. Brock Lesnar is a career killer. Brock Lesnar is a merciless sadist with an unrepentant soul. 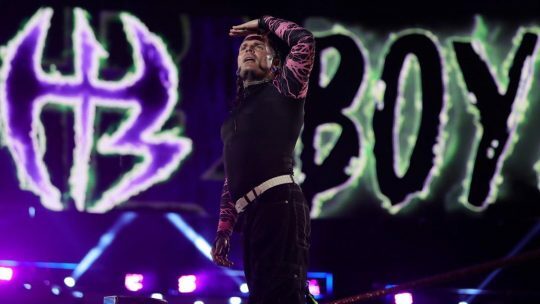 If Rollins goes into WrestleMania with the mindset that he’ll do anything including making WrestleMania the last match of his career, then he’s on a suicide mission. 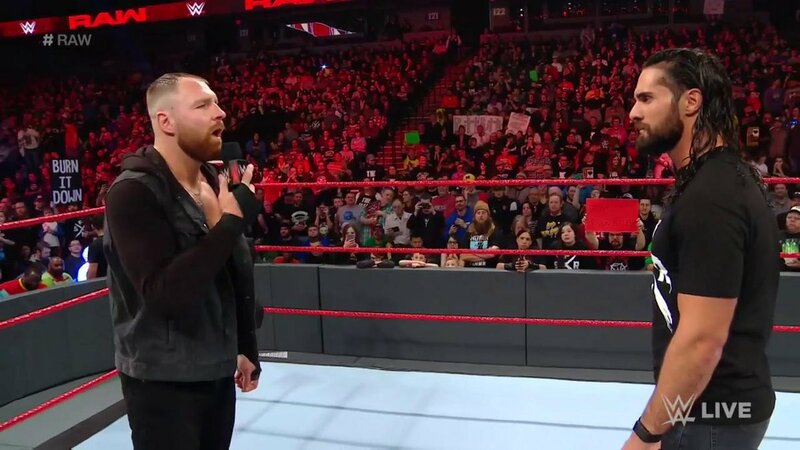 Heyman is giving him fair warning: if he walks into WrestleMania and tries to take the Universal Title from Lesnar, he’ll be the architect of his own demise. That is not a prediction. It’s a spoiler. Rollins says Heyman is right, but what he doesn’t seem to understand is that he doesn’t care. Brock Lesnar has held this industry that he loves more than anything hostage for too long. Rollins will not stand for it anymore. Rollins doesn’t care if WrestleMania is a suicide mission. He’ll be that martyr. He’ll sacrifice his body, his heart, and sell his soul to the Devil. Rollins will burn in Hell to avoid having Lesnar continue on as Universal Champion. Rollins says that is not a prediction. It’s a spoiler. Heyman looks concerned and goes to the back. Dean Ambrose’s music hits, and he makes his way to the ring. Rollins looks confused. Ambrose asks for the microphone, and Rollins gives it to him. Ambrose has one thing to say to Rollins: “Slay the Beast.” Ambrose nods at Rollins and sits in the timekeeper’s area. Rollins smiles and walks off. Ambrose quickly takes EC3 down and stomps him. Ambrose sends him into the ropes, but EC3 gets out of the ring. Ambrose chases him into the ring, and EC3 stomps away at him. Ambrose hits a flying back elbow. EC3 avoids an avalanche and clotheslines Ambrose. EC3 punches away at Ambrose and chops the chest. EC3 connects with a clothesline and hits a missile dropkick. EC3 connects with a suplex for a two count. EC3 applies a nerve hold, but Ambrose fights up. Ambrose chops him before hitting the ropes, but EC3 scoop slams him down. EC3 drops an elbow and lifts him up. Ambrose slides off and sends him shoulder-first into the ring post. Ambrose catches him with a pair of clotheslines coming in the ring. Ambrose lowers his head and eats a kick, but he quickly comes back with a swinging slam for a two count. Ambrose goes to the top rope, but EC3 crotches him. Ambrose quickly catches him with an inside cradle for the win. Becky Lynch is seen sitting backstage when Alexa Bliss walks up to her. Bliss tells her not to apologize and show weakness. Bliss says a lot of the girls in the back look up to her. Bliss tells her to not say sorry. Lynch says if she doesn’t apologize, then that frees up her place for the RAW Women’s Title at WrestleMania. 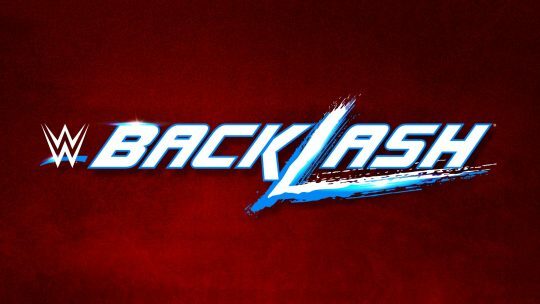 Lynch asks if this has anything to do with the fact that Bliss wants her spot at WrestleMania. Bliss says she would never. She just wants to see Lynch be true to herself. Lynch says there isn’t a genuine bone in her body. Bliss says she can apologize and not be The Man. She’ll just be a sellout. Lynch says if she does apologize, the only thing she’ll sellout is WrestleMania. Lynch walks off. Chad Gable starts against Dash Wilder. They lock up, and Wilder applies a side headlock. Wilder is whipped off, but he shoulder blocks him down. Gable soon comes back with a hip toss. Gable applies an arm bar, but Wilder fights up and hits a slam. Scott Dawson tags in, but Gable takes him down and applies an arm bar. Dawson fights up, so Gable does some flashy moves and takes him down. Dawson uppercuts Gable and punches Roode. Roode fights him and Wilder off before Gable wipes out The Revival with a diving double clothesline. They then hit stereo back suplexes. Gable then hits them with a moonsault block off the top rope to the floor. We come back from the break to see Wilder clubbing Roode. Dawson tags in, and Roode fights them off. Gable tags in and punches Dawson down before hitting a dropkick. Gable then takes Wilder down. Gable punches Dawson in the corner before taking Wilder down. Gable hits Dawson with an inverted atomic drop before giving Wilder a belly-to-belly suplex. Gable soon catches Dawson with a German Suplex bridge for a two count. Gable counters a sunset flip into a roll-up for a two count. Roode comes in and throws Wilder over the top rope. The Revival snap Gable off the top rope for a near fall. They argue with the referee. Dawson takes Gable down before dropping Wilder on him for a two count. Gable fights off The Revival and nearly tags in Roode, but he’s stopped. Gable then takes Dawson down with a back suplex. Wilder pulls Roode off the apron. Wilder tags in, and they hit Gable with a double-team backbreaker/elbow drop combo for a two count. Dawson blind tags in while Gable hits Wilder with a German Suplex. Gable then hits Dawson with a German Suplex… and we go to a commercial break. We come back from the break to see Roode get tagged in. Roode takes them down and gives Wilder a front suplex onto Dawson. Roode shoulders them in the corner and goes to the second rope. Wilder moves. Roode throws Dawson out of the ring before catching Wilder with a spinebuster for a near fall. Roode tries for a Glorious DDT, but Wilder rolls him up for a two count. Dawson tags in, and they hit a double-team Gory Special/clothesline for a near fall. Roode rolls Wilder up while Gable hits Dawson with a cross-body. Roode picks up a two count. They try for a neckbreaker/moonsault combo, but Wilder gets out. They then hit a blockbuster/German Suplex, but Dawson breaks it up. Gable takes Dawson out and rolls Wilder up for a two count. Wilder goes to the top rope, but Gable cuts him off. They hit a powerbomb/diving clothesline, but Roode knocks Wilder into Dawson to break it up. All four men are down. A light “This is awesome” chant picks up. They get Roode out of the ring. Gable rolls Dawson up for a near fall. Wilder tags in, and they catch Gable with the Shatter Machine for the win. The Revival celebrate with their newly won championships and go backstage. Charly Caruso immediately catches them with an interview. They say they’re the best tag team around the globe before hugging and walking off. Becky Lynch is standing in the ring. Triple H and Stephanie McMahon make their entrance. McMahon says it has been a long night for everyone. Is she going to go on to live her dream at WrestleMania or not? Triple H says whether she believes it or not, they want this to work out. 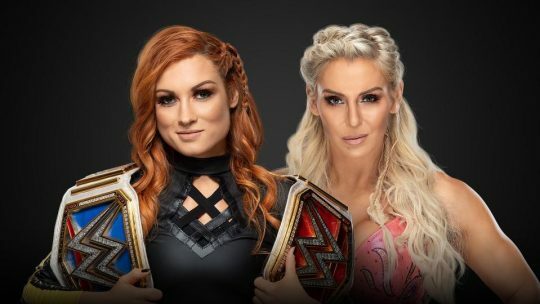 McMahon says she meant what she said earlier: Becky vs. Ronda Rousey could be the biggest match in WrestleMania history. They apologized and accepted responsibility. Will Lynch do the same or will she throw away her moment in history? They extend their hands, but she won’t shake them. Lynch says her path to WrestleMania is clear. Now if anyone stands in her way, they’ll be put down. No one is taking her dream from her. Triple H says she’s going to WrestleMania. She shakes hands with them and they walk off. Lynch asks if that’s really it. They say it is. “Rowdy” Ronda Rousey’s music hits, and the RAW Women’s Champion makes her way to the ring. Mr. McMahon comes out and tells them to wait a second. McMahon says before they do something silly, he thinks Stephanie is right. 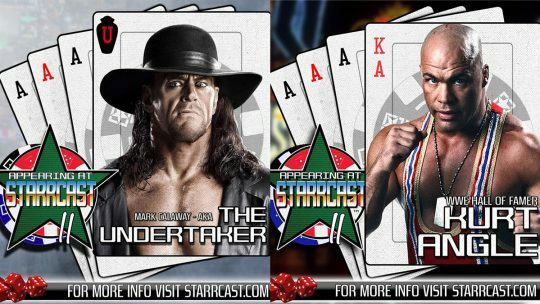 This could be the biggest main event in WrestleMania history. Still, Lynch has a bad attitude. Same for Rousey. Lynch is not The Man. He’s the man. McMahon suspends her for 60 days. McMahon doesn’t accept her apology. That suspension runs out five days AFTER WrestleMania. To take her place, he’s putting Charlotte Flair in the main event of WrestleMania. McMahon says Flair is going to win the RAW Women’s Championship at WrestleMania.